This Foundation supports the Reach Out and Read, Tutor.com, and Solano Kids Read, primary programs of the Solano County Library. 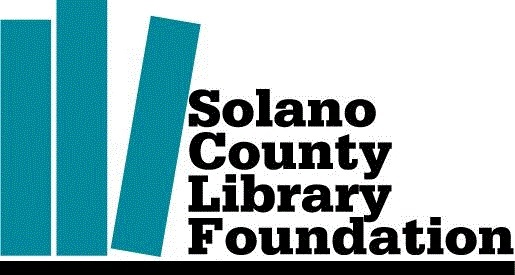 The mission of the Solano County Library Foundation is to support programs of the Solano County Library and the literacy and lifelong learning needs of the community it serves. Tutor.com combines live online tutoring, homework help, and test preparation with highly qualified tutors in a variety of subjects from algebra, calculus, and statistics to English, chemistry, and physics. Every session is one-to-one and personalized to the student’s subject and questions. Students access this free site using their Solano County Library card number via the Solano County Library website. Our program, Reach Out and Read, which gives young children a foundation for success by incorporating books into pediatric care and encouraging families to read aloud together, handed out over 11,000 books in 2017. We celebrated a milestone this year of having supplied 250,000 books since the program’s inception in 1999. Our program, Tutor.com, which combines live online tutoring, homework help, and test preparation with highly qualified tutors in a variety of subjects from algebra, calculus, and statistics to English, chemistry, and physics, provided over 7000 tutoring sessions inn 2017. SCLF has received a funding commitment from local philanthropist Dr. Ash Varma, Anesthesiologist, to match dollar for dollar all contributions made to our organization up to $9,000.